Russian jets hit 12 Islamic State targets in the course of nearly 20 combat flights carried out in Syria on Tuesday, the Defense Ministry said. Command centers and training camps were destroyed in the attacks which threw the extremists into panic. "Su-34, Su-24M and Su-25 have launched air strikes on 12 objects of logistic infrastructure, command posts, training camps and facilities of militants belonging to terrorist groups allied with Islamic State [IS, formerly ISIS/ISIL],” Igor Konashenkov, Russia’s Defense Ministry spokesman said in a statement on Tuesday. The Russian jets destroyed an Islamic State army munitions plant outside Damascus as well as two command centers in Deir ez-Zor, according to the ministry’s statement. In the Idlib Governorate, a training camp for IS militants was eliminated, while several IS strongholds came under attack where ammunition depots were blown up. Russia’s targeted airstrikes have caused “panic” among the militants, Konashenkov said, also stressing that the attacks are not conducted in residential areas or places containing landmarks. Meanwhile, the Russian Defense Ministry does not rule out the possibility of Islamic State preparing provocative acts in Palmyra and other Syrian cities, such as bomb attacks on mosques, to put the blame for it on Russian aviation, Konashenkov said. The ministry published a fresh video said to show extremists positioning their hardware near a mosque. 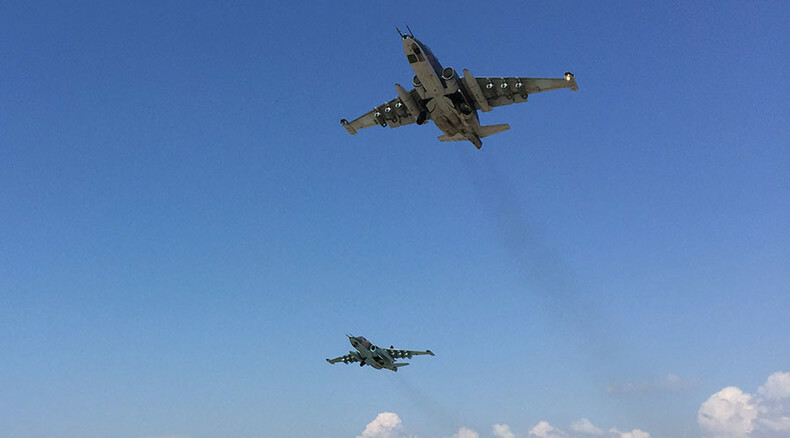 Hmeymim airbase has been used by the Russian Air Force since Moscow launched its anti-IS operation last Wednesday, following a request from Syria’s President Bashar Assad. The Russian combat unit is comprised of over 50 aircraft and helicopters, as well as space surveillance equipment and drones. Moscow began carrying out airstrikes supporting the Syrian army’s ground operations on September 30. On Tuesday, Russia offered to resume talks with the US to avoid any misunderstandings concerning its air operations. A US-led air campaign started in Syria a year ago. The Russian Defense Ministry doesn’t rule out the possibility of Islamic State preparing provocative acts in Palmyra and other Syrian cities, such as bomb attacks on mosques, to put the blame on the Russian air operations, Konashenkov said. Russia began carrying out airstrikes supporting the Syrian army’s ground operations on September 30. On Tuesday, Moscow offered to resume talks with the US to avoid any misunderstandings concerning its airstrike operations. A US-led air campaign started in Syria a year ago.